How to Prepare Bathue Raita ( Curd preparation)? Raita is a popular Indian side dish eaten along with curries and chapati (roti). There are varieties of raitas which are nothing but curd preparation with various other ingredients. Stir the curd with hand mixer (mathani). Add bathua paste and mix well. If it becomes thick add little milk and mix it. Now add salt, cumin powder and chili powder, mix well. Keep in refrigerator for an hour or so. Serve chilled bathue raita with rice, parathas etc. How to Make Pudina Raita? Simple Recipes Preparation Method : How To Make Pudina Raita ? How to Make Tomato Onion Raita? Tomato onion raita is deliciously made with curd, tomato and onions seasoned with a tempering of mustard and cumin seeds, fresh curry leaves and spiced with some green chilies. Pyaz tamatar ka raita is generally served with rice and roties. Learn how to make tomato onion raita. Simple Recipes Preparation Method : How To Make Tomato Onion Raita? How to Make Boondi Raita? Add water to gram flour and mix well to spreading consistency. Add salt & beat till becomes light. Heat oil & pass the paste through draining spoon. Fry till golden & crisp. Stir the curd with hand mixer(mathani). Add boondi and mix gently. If it becomes thick add little milk and mix it. Sprinkle garam masala and garnish with chopped coriander. Serve boondi raita chilled !!! Pineapple raita is a cooling and refreshing side dish for any meal; it is a perfect blend of pineapple chunks and creamy yogurt. Learn how to make ananas ka raita by following this easy recipe. Simple Recipes Preparation Method : How to make Pineapple Raita ? Take the curd in a bowl. Add sugar, cumin seed powder and salt. Beat the curd until it becomes smooth. Add chopped green chili in it and mix well. Add pineapple chunks in it and mix well. Take out pineapple raita in a serving bowl and garnished with chopped coriander leaves and the sprinkle black pepper. How to make Aloo Ka Raita? Simple Recipes Preparation Method : How to make Aloo ka Raita ? Dal Makhani (Hindi:दाल मखनी) ("Lentil rich sauce") is a delicious staple food from Indian Cooking masters. The primary ingredients in dal makhani are whole black lentil (urad). It is not only popular in Indian restaurants but also globally served in International restaurants. We are going to share this simple to cook tasty recipe which is also a prominent food for vegetarians. Though its considered very difficult to cook, the Simple recipe cooking method is very easy through which you can create a tasty dish in no time. We are preparing a No Onion Dal Makhani or Jain Dal Makhni. Wash and Soak the Whole Black Urad Dal Overnight or 4-5 hours in water. Take the Dal Makhani out of soaked water and throw away that water. Put the Dal Makhani into Pressure Cooker and add 500 ml of Water ( 3 Cups ) and add salt as per taste. Now cook the Dal for 20-25 mins on Slow gas flames. Let the Pressure Cooker cool down for 5-10 mins. Take a Kadai and add Butter and then Hing and all the other masalas ( Red Chilli , Dhaniya, Garam Masala , Ginger , Tomato puree ,Green Chilli pieces ) one after other quickly and Fry it to make a paste. Now add Cream into the Frying Pan (Kadai) and make a Good mixture. Take out the Dal out of Cooker and add it into the Frying Pan. Cook it for 5-6 mins now and then it is ready for garnishing. Garnish with cut coriander and white butter on top. Your Hot Dal Makhni is ready to serve now. Dal Makhani tastes good with Indian Chapatai / Roti . Check How to make Roti also. Aloo ka paratha is an Indian dish which is eaten extensively during breakfast and is also a popular snack. The best combination for this Aloo Paratha is a cup of yoghurt and some spicy and tangy pickles. It is as popular as Burger in USA :) Here is a video recipe on how to prepare a Aloo ka paratha. You might have already seen How to make Aata / Dough Video . Follow that Video to make the Dough balls first and then you are ready to take it a step further and prepare an Aloo Paratha. This is one form of Stuffed Paratha. The other forms of stuffed paratha include Paneer ka paratha, Gobi ka paratha etc. P.S: Aloo ka Paratha is a Calorie rich food item which is cooked with Ghee / White Butter. Step 2 : Make a Mashed Potato (aloo) mixture. Add Salt, Red chilli, Dhaniya powder, Amchur Powder , Small pieces of Green chilli in small quantities. Step 3: Take a Tawa and use Ghee /White Butter to cook the paratha to a golden brown color. You can also use Refined Oil, but the Paratha gives its Original taste only with Ghee or Butter. Aata / Dough needs to be prepared when you decide to prepare Roti or Paratha. That's the basic step which you need to do in order to prepare a good roti or paratha. Dough Balls need to be made first by mixing right amount of water. Making Bread Dough is easy by this procedure and you don't need any Dough maker or Dough machine to do that. You might have seen our post on How to make Roti and how to move ahead of that first step of making the Dough or Aata. We have made a short video to help you prepare the Aata or Dough in a perfect manner. How to make Aata / Dough for Roti ? Roti ( रोटि ) is an Indian Bread made from wheat flour also known as atta. There are many different types of roti made from different types of flour. Here we will be discussing the simplest form of Roti. Roti is usually round in shape and cooked on a Tawa (Non Stick Flat Pan) and then on Gas. It is also known as Chapati or Tawa Roti / Sada Roti. Now take water and mix it in Wheat flour and make a soft dough. Add water very slowly and at same time keep mixing the whole mixture. Stop pouring water the moment the dough is soft. Take a single piece of round ball, dip it in dry wheat flour and make it into a round sized circle of 3 inch radius with a Belan on a chakla ( a wooden piece of kitchen item ). Can also use a flat dias instead of chakla and a item similar to belan to roll the aata balls. See the image. Heat up the Tawa and put the rolled up dough on the Hot Tawa. Roll it to other side after 30seconds with help of a Tong. Now let it cook for 1 min. Can also use a rolled up handkerchief to puff up the roti's. 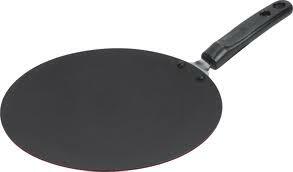 Now take it of the Tawa and put it under the direct gas flame and cook it from both sides. Keep turning it on regular basis till it puffs up and is golden brown in color. Also Check How to Make Aata / Dough for Roti Video. Leave a comment to share your experiences . How to make Roti / Indian Bread Chapati? Gajar Ka Halwa (Hindi : गाजर का हलवा ) (sometimes known as Gajrela, Carrot Halwa or gajar ka gajerela) is a sweet dessert pudding. It is often served with a garnish of almonds and pistachios.Because of its low fat content, vegetarian characteristics, ease of making, medium shelf-life and taste Recipe of Gajar Ka Halwa which is a popular dessert all over India is given below . Cook often and serve at festivals to your dear ones. Wash and scrub the Carrot nicely. Cut both the ends and then shred it using a medium sized grater attachment. Take a Kadai (Deep Frying Pan) and add Milk and shredded Carrot into it and mix it. Cook it for 15-20 mins till Carrot softens. Let sugar dry up completely. No water should be left in the Pan. This will take another 10-15 mins. You will notice a change in the color of carrot. Add Khoya into the Pan and mix it well. Cook this mixture for 7-8 mins. Let it dry while stirring. Garnish it with Cashewnuts and Kishmish. You are now ready to serve the Gajar ka Halwa to your guests, family or your Valentine. Note : You can also add Milkmaid instead of Khoya, but do not add Sugar in that case. Bhindi ki Sabji(भिंडी की सब्जी) is an Indian Dish also known as Lady Finger(okra). Its cooked in various styles in various part of nation. This recipe is the simplest form which can be cooked in 10 mins once washed and cut.It is called as Okra Stir Fry also. Now add Ajwain and Haldi in quick succession and add Bhindi (Lady finger). Do it quickly to avoid burning of masalas. You will here the crackling voice once you add the Ajwain and Haldi. After 7-8 mins , Bhindi is cooked. Now add Dhaniya powder, Amchur powder and Chilli powder and mix it and cook it for another 2-3 mins. Your bhindi is ready to serve. P.S : Fry the Bhindi/Ladyfinger when you want to eat it as it tastes good when hot. Chole bhature (Hindi: छोले भटूरे), is a combination of chole (spicy chick peas) and fried bread called bhatoora (made of maida flour). 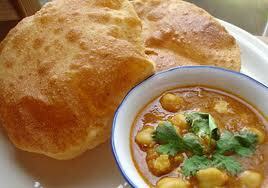 It is also called Chola poori since the bhatoora resembles a poori. Chana or Chole to be soaked in warm water for 4 hours before cooking it. Alternatively you can also put it in a pressure cooker for 1/2 an hour to soften it. Don't forget to put some salt and water when you soften it in pressure cooker. Take a frying pan , put 2 tablespoon butter/ghee , add some cut onion pieces/onion paste (not required for Jain Chole). Make paste like thing and add Garam Masala, Lal Mirch, Dhaniya Powder, Chana Masala one after other. Turn the softened Chana into the Frying Pan. Make sure to add some water if there is less water in Pressure cooker. Take small loaf of the dough and roll it up in round circles and deep fry in Hot oil till its light brown from both sides.You will have to press a bit in the middle for the Bhature to puff up and also keep turning it. Thanks for going through our Chole Bhature Recipe . Share your cooking experiences.